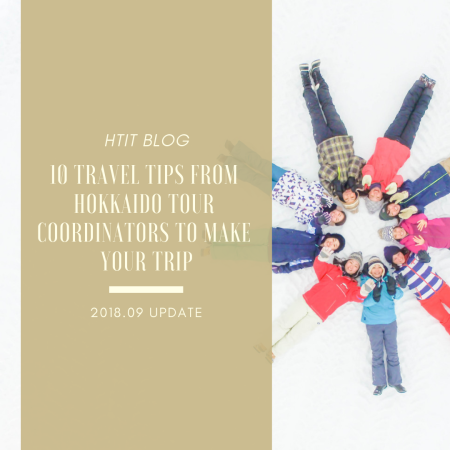 A Winter Paradise Tour with Glamorous Cranes and Powerful Drift Ice | Hokkaido Treasure Island Travel Inc. Please check the bottom of this webpage for price details. What comes to mind when you think of the word ‘paradise’? Nature is left in its original state, majestic yet vulnerable at the same time… In Eastern Hokkaido, mother nature will be your host. Healing hot springs, dancing cranes, and a magical white carpet of ice and snow, will calm your mind and warm your heart, even in temperatures below -20ºC! You will also be welcomed by the highest level of hospitality and service at the hotels you stay in. The delicious Kaiseki Dinner is the freshest, best of the best catch from the surrounding oceans. You can relax completely in the Onsen under a star filled sky; truly satisfying for your soul. With postcard perfect landscapes and winter-limited delicacies, this tour will surely be an unforgettable experience for you. Welcome to Hokkaido! After your arrival, our driver will take you to Tokachigawa Onsen, in the midst of the Tokachi plains, famous for vast landscapes and delicious produce. Depending on your arrival time, you can try the best Soba noodles in Shintoku Town for lunch! 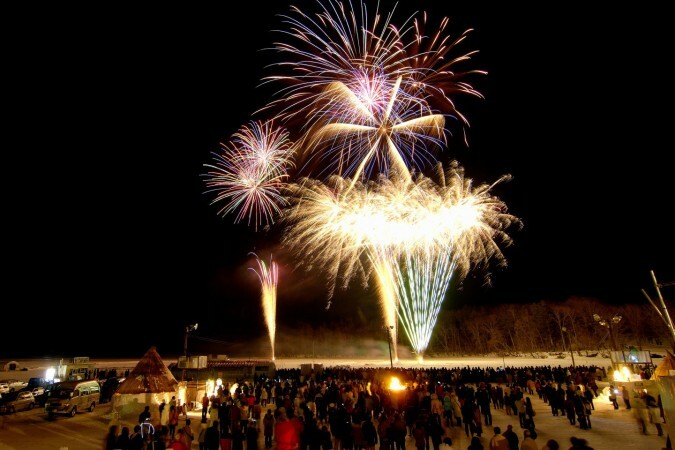 Visit the Swan Festival to see nature’s beauty, and Sairinka Festival at night for a rare colorful display of light and sound reflecting on Hokkaido’s sparkling white snow! After a Kaiseki Dinner at your hotel, a Moor Hot Spring Bath is waiting for you to relax. Depart Tokachigawa in the morning and enter the ‘heart’ of Eastern Hokkaido, Kushiro and Akan. On the way, stop by Ikeda Wine Castle to taste the popular wine of the region, and enjoy the rich flavor of ice cream made on a farm! Once in Kushiro, you will be excited to have lunch at the Washo Seafood Market: get a bowl of rice, walk around the market, and buy seafood of your choice for your own delicious seafood bowl. Add some Soy Sauce on top and it’s ready! After lunch, we are thrilled to take you to the crane observatory in the Kushiro Marshlands. In winter, the cranes dance a beautiful duet to attract their lifelong partner. Please have your cameras ready! Check in to your Lake Akan hotel with Onsen to warm up for the evening. You can also visit the Lake Akan Winter Festival at night for lively activities and winter fireworks reflecting over the frozen lake. Bundle up for some fun winter activities after checking out of your hotel. Snowmobiling, Banana Boat riding and ice fishing on the frozen lake are some of the great thrills available for the whole family! For lunch, enjoy a local specialty: ‘Teshikaga Ramen’. Eastern Hokkaido has many lakes, but one of the most famous is Lake Mashu, boasting its clear waters surrounded by mountains, especially beautiful under clear blue winter skies and snowy white surroundings. Visit Mt. Iou close by, a sulfur mountain boiling hot and steaming even in winter! Tonight you will stay at a special Onsen hotel in Yoroushi. If you’re lucky, you might be able to see a wild Blakiston’s Fish Owl from your hotel! Shiretoko is one of the most beautiful places in Japan, registered as a World Nature Heritage Site, thanks to the untouched nature and the large number of animals that call Shiretoko home. Drift Ice covers the vast ocean in this area; not only can you marvel at this rare sight, get as close as you can by walking on the drift ice as a special activity! Feel the power of nature! Your next stop this trip is Abashiri, northern Hokkaido. 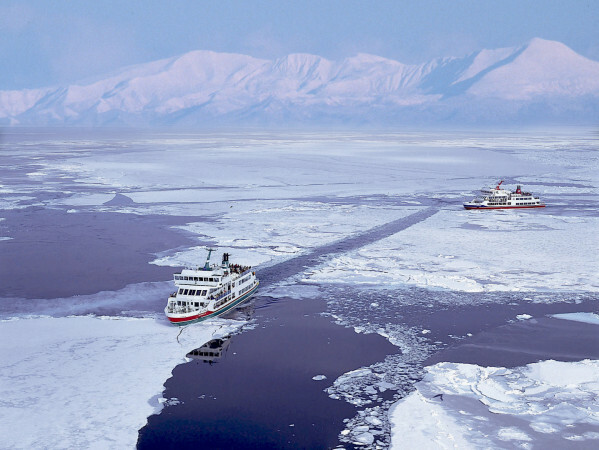 Enjoy a cruise on the Aurora Ice Breaker, and allow it to take you over the drift ice on the ocean. You may even see wild animals on the ice. 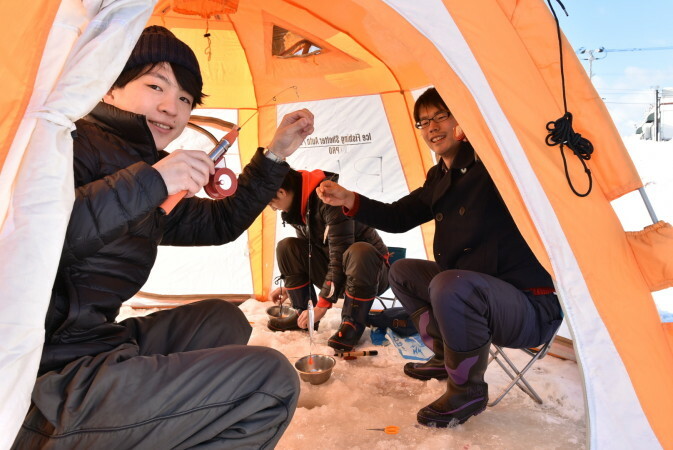 Another winter favorite is smelt ice fishing at Lake Abashiri; feel relaxed by the sights and excited by the possible catch just under the ice. Eat the fish you catch as tempura right on the lake! Check in to your hotel in Abashiri for the night. Keep your cameras ready during the drive from Abashiri to Sounkyo. See vast plains, large forests, and if you’re lucky, wild animals like deer, squirrels or foxes may greet you on the way! Even if you don’t have the chance to see one of these in the wild, we will take you to the Fox Farm, a great place to meet Kitakitsune (Northern Foxes)! After checking in to your hotel in Sounkyo, visit the Ice Waterfall Festival, for an exhibit of ice sculptures lit up beautifully, glowing fireworks at night, and more. Your next stop is Asahikawa, famous for Asahikawa Ramen! But before lunch, enjoy a ride of dog sledding! You will be surprised by the strength and speed of these loyal canines. Dig in to popular local Ramen at the Asahikawa Ramen Village to warm up. Back on the road, we visit the Sunagawa Highway Oasis for some souvenir shopping and local food tasting. Your final stop is Sapporo City. Check in to your hotel, and use the evening freely to enjoy the night lights and dinner at a restaurant of your choice. Seafood, Ramen, Genghis Khan, Soup Curry… all foods are available in Hokkaido’s largest city, Sapporo. Even the last day has a lot to offer! Enjoy some free time in the city before your departure. Do some last minute shopping downtown before heading home, or enjoy shopping on the way at one of the outlet malls near the airport. In case you didn’t have enough of Hokkaido’s delicacies, plenty of seafood and souvenirs are available for you to enjoy at the airport; there is even an Onsen! We hope you were able to discover your treasure on this island! 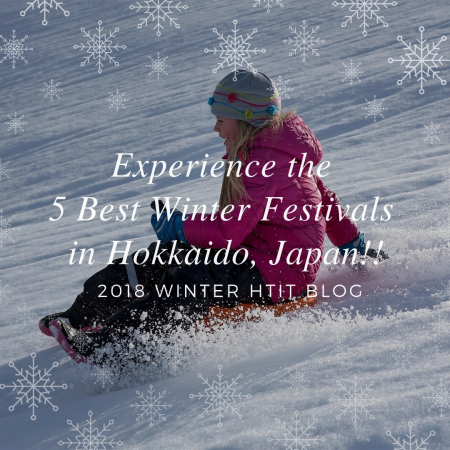 Experience the 5 Best Winter Festivals in Hokkaido, Japan!! 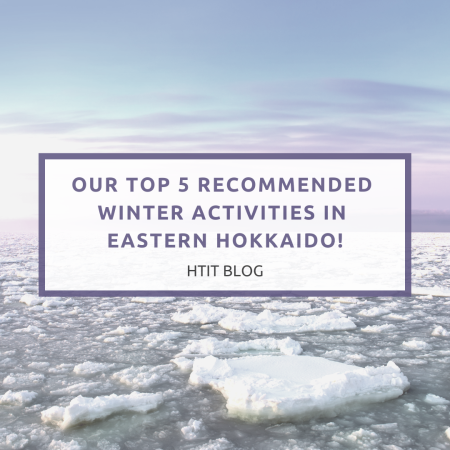 Our Top 5 Recommended Winter Activities in Eastern Hokkaido!